Bowhunting the convoluted country of ridges and ravines, benches and draws takes special tactics but can pay off big. Many life lessons for a bowhunter take a lifetime to learn, but fortunately some of them come faster. My education in the difficulty of hunting rugged-country bucks began right from the start—deep in a draw a mile up a wide ravine from the Mississippi River. I’d just found a jaw-dropping array of big buck sign spread throughout the bottom of the 300-yard-wide ditch. This particular farm had produced some tremendous bucks through the years for the gun hunters who ran their annual pushes here. I put my stand up and snuck out, sure that I would be dragging a buck the next time I followed the same route. A week later, the conditions were perfect for the payoff. The rut was going strong, and the wind would be blowing straight from the scrapes toward my stand. After climbing the tree, I was confused when I found the wind kissing the back of my neck instead of my face. Then it was nudging my left cheek and, a moment later, my right cheek. Every time the wind gusted, the breezes around my stand blew in a different direction. I never saw a deer that whole afternoon, but I sure heard plenty; they were snorting and stamping. It took a few more similarly bad stand setups to reinforce the lesson I learned that day, but within a few seasons I knew that there is only one place to bowhunt whitetails in ridge country: on the ridges. Becoming a good rough-country bowhunter revolves around understanding how the terrain affects the movements of the wind and how it affects the movements of deer. Both are predictable. After many years of hunting the broken country, my education is still in process, but I have concluded one thing: ridges and benches hold the most promise and are the easiest to hunt. If you learn to hunt them well, you’ll take more than your share of rough land bucks. It doesn’t matter what the deer are doing if they smell you before they get into bow range, so the first priority anytime you hunt ridge and bluff country is to find spots where your scent will blow in a predictable direction. You may as well realize right up front that the wind is not your friend. At best it is a patient enemy. Anytime you place your stand in an area that is protected from the direct blast of the wind, you can expect swirling and trouble. Hunt either near ridgetops where the flow is unbroken and consistent, or sparingly in wide draws where swirling is reduced. If you take nothing else from this article, remember that getting the wind right is the greatest challenge of bowhunting broken country. 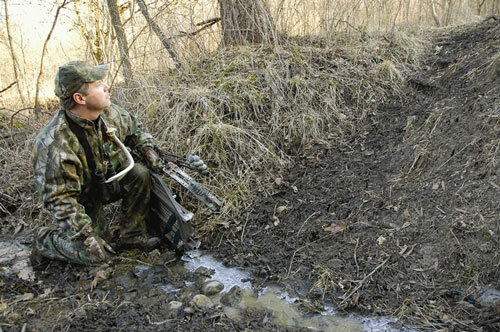 Ridges offer excellent visibility and maximum security to bedded deer. Most ridges extend out over a bottom area or ravine, and the point where they end is usually a heavily used bedding area. As you move farther back along the ridge, away from the bedding areas and generally toward feeding areas (acorn-dropping oak groves or cropfields), you’ll find heavy trails on top. Does and fawns use them most often, but bucks will also travel here if the hunting pressure is light enough or the rut is near its peak. On either side of the ridge, you will find trails about 30 to 40 yards down the hill. These won’t be as heavily used and will often be marked by rubs. In order to keep a low profile, bucks are most apt to travel these sidehill trails while using the wind to monitor activity that is taking place on the ridgetop. For this reason, the trail on the downwind side of the ridgetop is a great stand site.